Alternatively enjoy a leisurely cruising morning along the majestic Saône River on your way to St. Jean de Losne or join a Guided Optional Excursion to the Castle of Cormatin. Continue on the Rhine and stop in Breisach, the gateway to Germany’s Black Forest, well known for Black Forest ham, cherry cake, and cuckoo clocks. In Strasbourg, France, stroll through the picturesque La Petite France district. Visit the ruins of Heidelberg’s castle, and stop in Mainz for a guided walk and a visit to the captivating Gutenberg Museum. 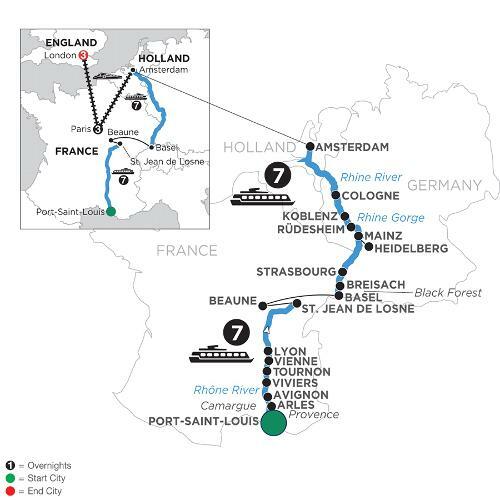 Sail through the dramatic Rhine Gorge, the most beautiful stretch of the Rhine River. Your last stop in Germany is Cologne, where a guided walk shows you the highlights of this 2,000-year-old city. A stay in Holland’s popular, modern capital of Amsterdam is the perfect way to conclude this sensational European river cruise. And the best way to see the treasures of this 700-year-old city is on a canal cruise along the elegant Grachten lined with homes dating back to the city’s “Golden Age." Then you’ll transfer to Paris for your Monograms vacation package, including 3 nights in Paris and 3 nights in London. Enjoy guided sightseeing and take photographs of the iconic landmarks of these 2 beautiful cities. All of this, and plenty of free time to explore on your own, gives you variety, convenience, and the chance to make this fabulous vacation your own!